Salt Wood Products, Inc. has built quite the reputation throughout the years for our quality wood products. What started as a pressure wood treating facility in 1957 has quickly grown into one of the top outdoor furniture companies around. We manufacture and sell a variety of items, from wood specialty items and building supplies to hardware, outdoor furniture, playground sets, and more. We have and always will put our customers’ needs as a priority. Our friendly and knowledgeable staff members have years of experience in the industry and know exactly what it takes to make you fall in love with your backyard. We will listen to your vision and help you select the perfect piece of furniture or equipment for your specific space. 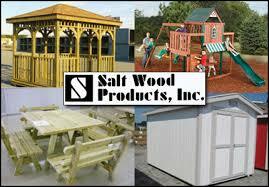 Visit Salt Wood Products, Inc. today to start shopping our amazing collection of decks, playground sets, storage sheds, and more. We look forward to your visit!